We chose this dataset because of my personal experiences with situational disability, which is a temporary state imposed by a person's current environment that results in an accessibility issue. This inspired a general interest in disability for me and I ended up taking an Inclusive Design class with the Human Centered Design and Engineering program at the University of Washington. Secondly, we decided to pursue the arts and culture space because of our interest in the arts. As musicians, both my and my project partner have faced issues with finding spaces to create, and we think this issue can only be worse for artists with disabilities. The data source chosen for this assignment is the continually updated Seattle Cultural Space Inventory. It is housed on the government website, data.seattle.gov and allows the export of this data is several forms. The information is collected by the Office of Arts & Culture who, in conjunction with a previous University of Washington planning and design team, created the surveys and questions given to the community ("Best Practices," SpaceLab NW). The ADA “a civil rights law that prohibits discrimination against individuals with disabilities in all areas of public life, including jobs, schools, transportation, and all public and private places that are open to the general public.“ For a building to be ADA compliant, it must have a number of design spaces incorporated into it, including curbs, ramps, railings, signage etc. A building can be fully compliant, partially compliant, or non-compliant. In order to zoom in on our main interest, which was accessibility, we refined the data set a few ways to make it more human readable and comprehensible. Our design iterations (shown below) required a focus on columns like "Neighborhood," which shows neighborhoods in Seattle and their names. Another column identifies the cultural spaces at the time of input as being Rented, Owned, or Other; other including any situations that cannot be determined as exclusively rented or owned. The third column identifies the ADA compliant cultural spaces as being fully compliant, partially, or not ADA compliant. The fourth column is the location of the space provided by coordinates in a latitudinal and longitudinal decimal format. Our sketches were based on some combination of these columns. In each case, we performed a few other refinements. For instance, several dozen spaces didn’t have any neighborhood. When googling these spaces, we found that they were in the greater Seattle area rather than within Seattle city limits. We removed them. Secondly, in the ADA compliance and renting status columns, we found several dozen empty spaces as well. Since there was already a value called “I don’t know” in this column, we removed the empty spaced locations as well. Q: Where are the ADA compliant cultural spaces in Seattle? Q: The second question is: what neighborhoods need improvement? 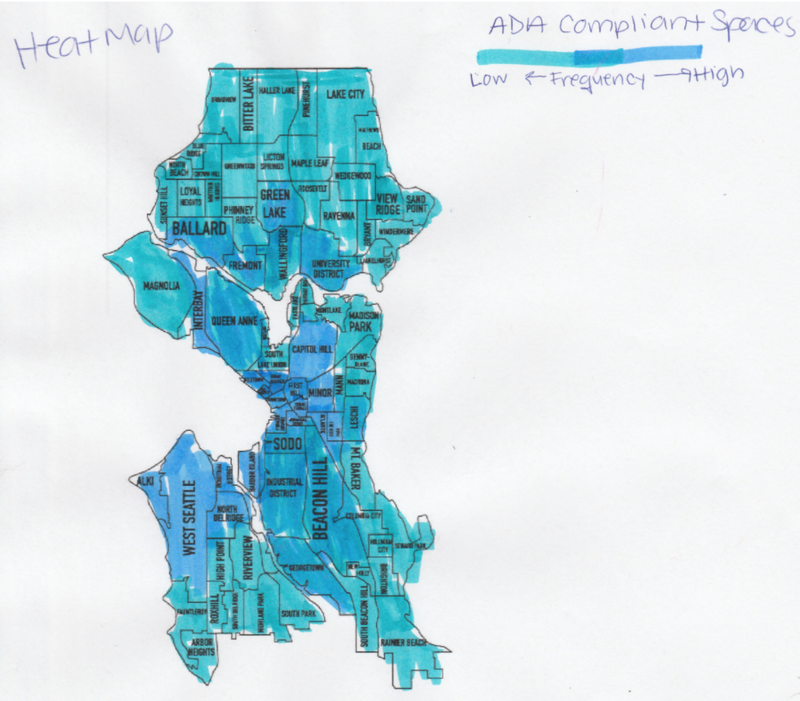 This sketch is a heat map of Seattle neighborhoods, and the intensity of the color represents the frequency of ADA compliant cultural spaces. Rationale: When going through the data, we decided that focusing on ADA compliant cultural spaces is an aspect that falls in line with the diversity and inclusion initiatives proposed by the city of Seattle. 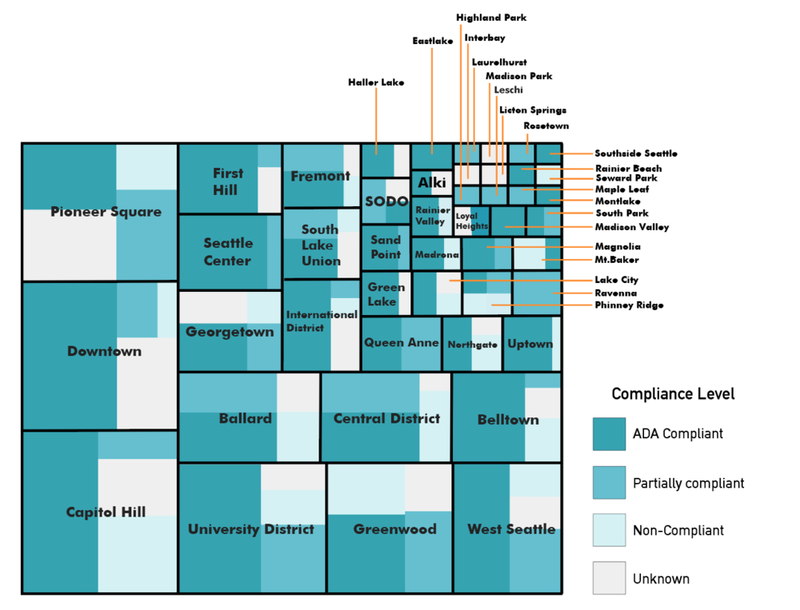 We felt that being able to look at a map of the neighborhoods, as represented by the data, we could make a visualization that depicts the density of ADA compliant places among each community and allow for a concise impression. Development : We chose to pursue this illustration further by developing a visualization using CARTO, which allowed us to plug in our data and receive a cartogram of ADA compliant spaces. The visualization (shown here) was chosen for the usability test because it was directly related to our primary interest in disability-friendly cultural spaces. However, while we did take the cartogram forward to the usability test, we chose to abandon it afterwards because of the inherent limitations of an "easy" tool like CARTO, discussed in the usability testing section. The second sketch is a treemap using three variables from the dataset: Rental Spaces, Neighborhoods, and Dominant Discipline. The "Rental Spaces" includes all "Yes" responses and refers to spaces to rent at that location. The neighborhoods are specific sectors populated by the citizens who ongoingly add to the dataset. The "Dominant Discipline" displays the category of discipline at that location, such as Music, Literary, Theater, and Arts & Culture. Rationale : When we thought to incorporate three variables, we felt that using the treemap would be able to convey the characteristics of the data. Utilizing the size, color, and position variables that are present in this type of chart, the user can see the relationships and differences between the variables. Development : We developed this sketch the most after simplifying the variables. Essentially, rather than only using rental spaces, we looked at all cultural spaces, and included a count of spaces. I then used RStudio to download the csv file, and used a library called Market Maps to generate the treemap, shown here. To develop it further, I downloaded the RStudio visualization as a pdf and uploaded it to Illustrator to add color and generate clarity. I used the Office of Arts and Culture logo to inform the blue and generated the rest of the palette from there. For the labeling, I faced certain challenges in the top right portion of the map, which was packed with locations to parse. Location names proved to be too long on occasion, and labeling lines had to stand out over the visualization. 4Culture is a non-profit that funds cultural spaces in the Greater Seattle Area. Using the 4Culture data, we decided to first look at the ratio of funded vs. non-funded or partially funded locations. Then by looking at the funded section, we break down how many which disciplines receive the funding. Rationale : With the fourth sketch, we wanted to focus on the organization 4Culture and the funding provided to these cultural locations. By looking at how 4Culture funds many locations or organizations and then continuing the analysis by dominant discipline, we can see what areas tend to receive the most funding. However, we did not proceed with this sketch as it didn't adhere to our central interest in disability. This stacked bar chart showing the number of organizations/locations funded and by which funding source, if any, and the dominant disciplines by funding source. The first source is an organization called 4Culture that provides help to King County communities with arts and culture events by way of resources such as funding. Rationale : We believed that seeing the break up of 4Culture funding by discipline uses the principle of vertical hierarchy to draw the eye to the highest point to see funding, as well as the break up of disciplines by funding. By placing the types of funding, or the lack thereof, as a stacked bar chart and next to each other, we ask the user to compare the three results as well as the breakdown of the funded disciplines. However, we did not proceed with this sketch either as it didn't adhere to our central interest in disability. 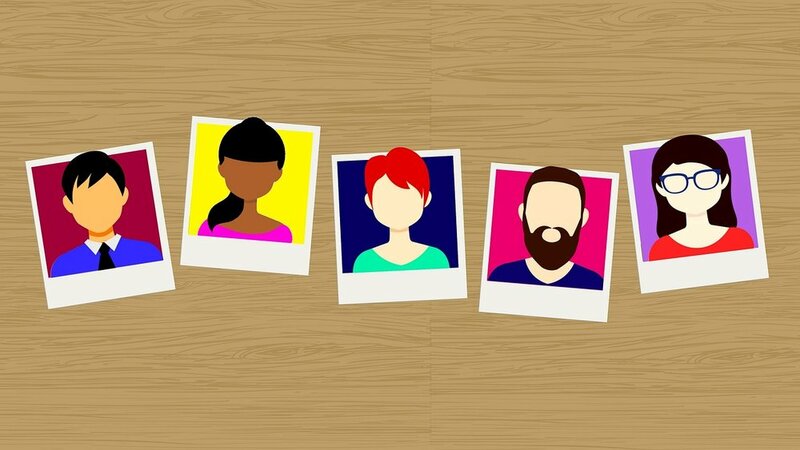 For the user tests, we mainly reached out to our existing networks, relying on our personal relationships with people with artistic pursuits. Between our five users, the common thread was some degree of involvement with the arts. Two are full time artists and three are part time artists. Two represent community groups we are targeting, with activist intentions. 3 are female and 2 are male. We deeply discussed the possibilities of testing the visualizations on artists with disabilities. However, it proved difficult to recruit them, which is why we pivoted to include artists in general who were interested in having a large audience. We used the task evaluation method, with "think aloud" protocol, which requires subjects to talk aloud as they go through the tasks. It helped us decipher what the subjects were really thinking. "Partial compliance is not the same as compliance to me." Task 1: Identify the legend on the map and locate any matching symbol near to where they live. Task 2: Identify areas on the map that you would describe as having many ADA compliant locations. Task 3: What more information would you like to have to decide where to rent? a) Multiple users asked for more informative annotations, for instance prices of the places to be rented, and marking up the places that are rentable. b) One user pointed out that simply showing a map with disability-friendly spaces isn't adequate. He said, "Partial compliance is not the same as compliance to me." c) One user asked for more context on the safety and security of the neighborhood, as well as an idea of relevant businesses in the area. We decided not to move ahead with our map because of the inherent problems with "easy" tools like CARTO. While CARTO does provide some flexibility in options, it's not flexible enough that all the user suggestions could be baked into the map. Partly it was the data set (like the partial compliance suggestion), but partly it was the suggestion of informative annotations, which could not be provided given the functionality of CARTO. Task 1: Identify the neighborhood you live in. Task 2: Within the neighborhood you have selected in the first task, what level of ADA compliance appears most? Task 3: Which neighborhood has the greatest number of ADA compliant spaces you can find? Task 4: What is your impression of cultural spaces in Seattle by ADA compliance? a) Make the map less busy, especially in the top-right. e) Use a color scheme and visual encoding that is indicative of what is being displayed. a) The color palette was changed to a monochromatic aquamarine palette(reflecting Seattle’s marine heritage and flag) with the darker, more visible colors corresponding to ADA compliant spaces with an increasingly whiter tint to indicate non-compliance or non-availability of data, which is a very light grey. The specific colors used were #2FA3B2, #61BFD0, #D4F1F4, and #EFEFEF in descending order of ADA compliance. b) The lines to indicate specific neighborhoods in the crowded top-right area were made perpendicular to the edges of the treemap. The lines were lengthened to create a clearer arrangement. c) The color of the indicator lines was changed to an orange(#EF953F) complementary to the aquamarine(#2FA3B2) that dominates the treemap to stand out against the backdrop. d) For uniformity, the font used was Futura Bold to stand out over the varying shades of blue and grey.